Angie and I met at college in Rapid City, SD. She and her roommate were just down the hall from me. At the time, I was a huge Slaughter fan – if you listened to hard rock before Nirvana changed it all you know who I am talking about. Angie also enjoyed listening to them. We became good friends and she ended up inviting me to go with her to visit her dad in Iowa. We had a great trip – lots of loud singing and Diet Coke on the road. We played pool and her dad let us smoke in the basement. We jammed the Wayne’s World soundtrack and roasted marshmallows in her backyard to the Dream a Little Dream soundtrack. We also practiced doing the Electric Slide in her dad’s driveway. I remember us finding out we both made straight A’s and her dad taking us out to dinner. We also drove to Ames to watch Wayne’s World again. When I got married, Angie drove all the way from Florida to be in my wedding. We stayed in touch – writing letters and talking on the phone occasionally. Over the years our communications became less seldom but I still thought of her often. One February morning, her husband called me. I had never spoken to him before so I knew something wasn’t right. Regrettably, I was not able to pay the same favor back to her by driving down to Florida to be in her wedding. Scott said that he received my card but in a thick voice, he informed me that Angie had passed away from a massive heart attack the year past. He cried and told me how strong their girls were trying to be for him and the last things they said to each other. Angie lost her father not too long before she passed away from a heart condition she inherited. She was one of the best people I have ever known – a deacon for her church, loving mother and wife, faithful friend, caring daughter and sister. She was at her father’s side when he took his last breath. I only have a handful of pictures of her and several handwritten letters. Angie is part of the reason why I write letters and mail greeting cards. I can see her handwriting and the little smiley faces she made. I can hear her voice and her laugh in the loops and curves of her cursive letters. In the age of social media, letters from a friend who I loved and cared for are priceless. I encourage you to write a letter a week to a family member or a friend. It is so much more exciting to receive snail mail from a loved one than a bill. Have a lovely Memorial weekend everyone and be safe! Tomorrow is the Daytona 500. We are usually excited but even more so this year since we will be going to the race in Las Vegas next month. When we received our tickets it was bittersweet because only three arrived in the mail instead of four. In years past, we invited friends over to watch the race or made sure we had plenty of pizza and snacks to celebrate. Over the years the boys started watching more races and picked their favorite drivers. Drew is a Dale Earnhardt Jr. fan and Christian liked Jeff Gordon. You can imagine our disappointment when Jeff Gordon announced his retirement, which just happened to be the year after we lost Christian. It was bizarre seeing Jeff Gordon in the announcers booth with a suit on instead of on pit road in his fire suit. I know Christian would have been bummed out not seeing the Dupont car on the track. Since we lost Christian, I cannot hold the tears back as the National Anthem is performed or when Darrell Waltrip yells “Boogity, Boogity, Boogity! Let’s go racing!” I would like to share some photos of our trips to Las Vegas to see the race. Christian and I just loved it when Darrell would yell at the beginning of each race so if you get the chance to tune in, even just for the “Boogity,” say it out loud for my son. Enjoy! Christian wore this shirt almost every Sunday. We set it out for the Daytona race last year. I became a Brad Keslowski fan after this moment. He pushed the table aside for the picture and was very kind and patient. Kurt Busch was the first driver the boys ever met. I am thankful he took a few moments for this photo. Dave and Drew all smiles as we wait for the green flag. Christian said meeting Michael Waltrip was the highlight of his last trip to Vegas! The smiles say it all. Author lhaneyPosted on February 21, 2016 Categories Family, Life, Memories, NASCARTags Brad Keslowski, change, Dale Earnhardt Jr., Darrell Waltrip, grief, Jeff Gordon, Kurt Busch, memories, Michael Waltrip, NASCARLeave a comment on Let’s Go Racing! The last thing Christian asked me to do with him was play Mario Kart. At the time, neither of us knew that it was our last chance to play together. He beat me every time but it was still fun to play. About a week after he passed away, I bought a WiiU. Christian used a Playstation and Game Cube but wasn’t sure if he would be able to handle the larger controller that came with the Wii. I had an evening by myself and I fired it up. Once I chose my character and started to play, my heart ached. Christian talked about playing on the Wii and how much he knew I would enjoy the graphics for Mario Kart. I felt close to him and my heart ached at the same time because I was not able to share it with him. Due to the nature of Duchenne Muscular Dystrophy, my sons were never able to ride a bike without training wheels or join the basketball team. Video games became something they could easily do and enjoy. Andrew plays Destiny on his PS4 often and has gained a group of online friends. In Montana, the winters are long and cold, making it difficult for people with disabilities to leave the house. He is able to socialize with his friends while he plays and has become quite passionate about the game. Christian was able to continue playing until the night before we lost him. His hands just stopped working. I will never forgot the look on his face when he told me he couldn’t hold the controller anymore. Our neighbors, Len & JoAnn, joined in and actually played. Even they had a blast! I think we all need to play video games every now and then. I played Mario Kart with Andrew last night and sorely lost, but it was fun and relaxing. It is so easy to say no, I would rather not. We never realize how fast our children grow until it’s too late and we are not cool enough to hang out with them. It becomes more real when your children are diagnosed with a life threatening condition. We can all benefit from putting our seemingly endless list of obligations on the back burner to play a game with our kids. I wanted to play video games with Christian that last day but his needs were great and we didn’t have any help. I really hope Christian smiles down from heaven as I pick up that controller a few times a week and practice so I can kick Andrew’s tail next time! This afternoon we sat down to play Yahtzee. Not an electronic form on the computer but the real, noisy, dice flying across the table version of Yahtzee. Ever since the boys were young, we enjoyed playing all sorts of boardgames. When I was a youngster, the most technologically advanced item we owned was a television – the giant boxy kind with wood accents that sat on the floor. No remotes. Get up and turn the dial to turn up the volume. We also owned Connect Four and Monopoly. My favorite was Connect Four. It was easiest to understand, more so than Monopoly. Since we weren’t quite old enough to understand the concept of owning property and making improvements, we would fight over who got the cute little dog game piece and make our own rules. I still remember the excitement when Yahtzee first came out. It was the first game I remember playing with my sister and my mother. We went camping and enjoyed playing it on rainy days when we were stuck in the camper. 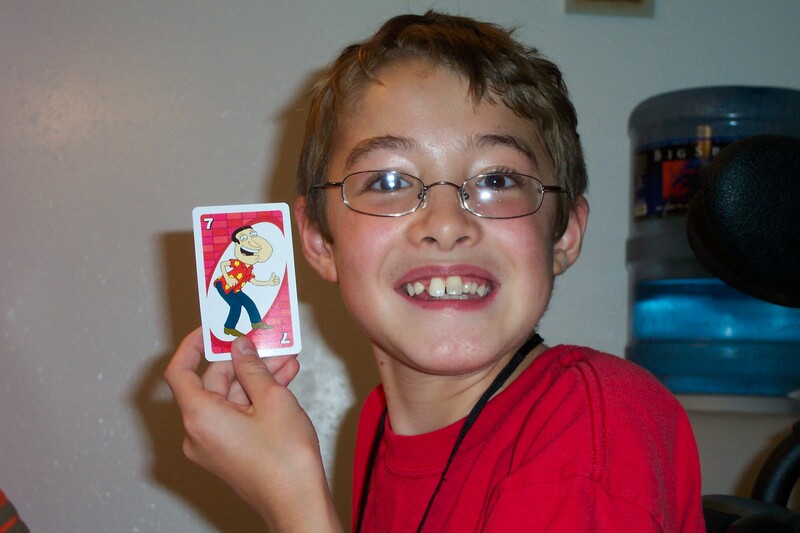 As the boys grew older, we started playing Life and different versions of Uno. Our favorite was Uno Attack. 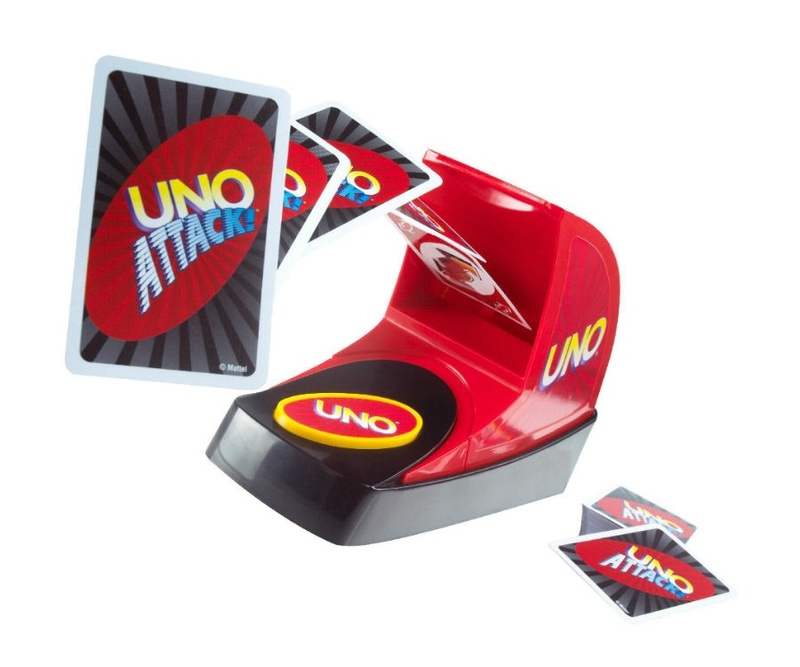 The game concept is the same as regular Uno but there are cards that instruct you to press a button. Once you press it, a random amount of cards comes flying out at you. The boys would laugh as the cards flew in their faces! I also taught them how to play Monopoly and we picked up a game in Spokane called Killer Bunnies. Killer Bunnies is the most awesome game ever played in our house. I may as well do a separate blog post because it’s so awesome. As Christian’s pain increased and his arms became too weak, he became unable to play most games. It hurts to remember how much he had lost, even something so simple and basic as playing a game of cards. Board games are a way to connect with loved ones in a way that is far too rare in today’s world. It is too easy to pick up our phones and play a little Candy Crush than to walk over to the closet and pull a game or two down. Throw on some good music, grab some drinks and snacks and make some memories with your favorite board games. What are your favorites, old or new? Author lhaneyPosted on September 10, 2015 September 10, 2015 Categories Family, MemoriesTags boardgames, Connect Four, Family Game Night, Killer Bunnies, memories, Monopoly, Uno, YahtzeeLeave a comment on Yahtzee!